At the age of seventeen, Minnow Bly has led a life that most people would find extraordinary. 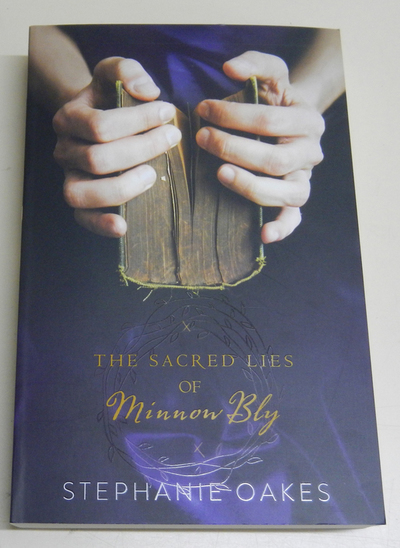 Isolated within The Community- a religious cult settled in a secluded forest- Minnow has had few interactions with the outside world since her parents joined the group twelve years earlier. Their polygamist lives, interspersed with hard labour, cruel punishments, religious worship of a ‘god’ called Charlie and unwavering support of their leader- The Prophet- has meant that Minnow’s inquisitive nature has been tampered down to almost nothing, although she is yet to be as brainwashed as her fellow people. The Kevinian cult, rather than strengthen her beliefs, has destroyed what little Minnow had, and, when an act of rebellion sees her faced with the ultimate punishment- the removal of her hands- Minnow knows that she will do whatever it takes to escape from the hell that her parents have put her through. You could be mistaken for thinking that this book is set during America’s colonial times (or at least the 1800s) considering the cult storyline and the distinctly archaic-style cover, but this is not the case. In fact, the modern-day setting makes Minnow’s ordeal all the more horrifying, especially the type of punishment she received and the way it was meted out. This debut novel cuts between Minnow’s experiences within the Community camp, her illicit relationship with a young black boy and her new life within the cells of the detention centre. It is fast-paced, powerfully written and quite unique in its content. Minnow’s friendship with her cellmate Angel is sweetly constructed and her burgeoning belief in Dr Wilson is symbolic of the way that she has learnt to slowly trust in people again. This novel is altogether different from many of the offerings you might come across in the young adult genre, and is a worthy read for those looking for a compelling and unique storyline. That sounds really intense. Great review!